Internet is full of boring popups. So, itâ€™s a time to break this trend. 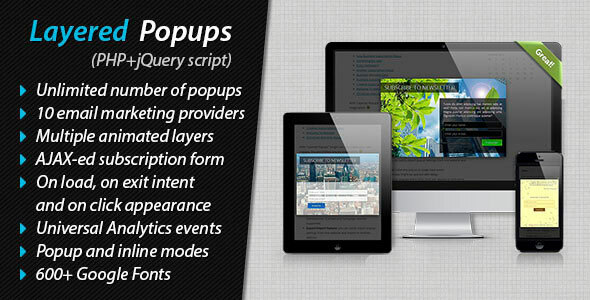 Thatâ€™s why I created â€œLayered Popupsâ€. With this script you can realize your imagination and make unique multi-layers popup windows. You can create multiple layers with whatever-you-want content and add custom transitions/animations for each layer. You can embed AJAX-ed subscription/contact forms which works with 10 popular email marketing providers (MailChimp, GetResponse, iContact, Campaign Monitor, AWeber, Mad Mimi, Benchmark, ActiveCampaign, Interspire and Sendy) and collect usersâ€™ names/e-mails.